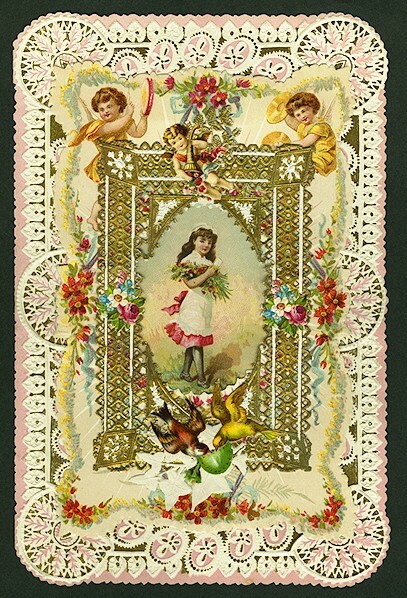 Yes, friends, it’s time for another round of Victorian Valentine’s verses from my two favorite sources: Hymen’s Rhapsodies (for gentlemen), and The Lady’s Own Fashionable Valentine’s Writer (for the ladies, obviously). Love you I must,—to marry won’t say nay. Aww. I hope he says yes. Delighted much to be your Valentine. List:–I announce you as my Valentine. Either return it, or life’s vain. It’s never a bad idea to start a romance with an ultimatum, right? Secure to pass a happy, merry life. Be not puff’d up and vain! A for effort, but no. To a Lady of Distinction. And nothing but Death shall divorce us. To be my dear charmer’s approv’d Valentine. To a Lady who had been lately Visited. And be my Valentine ! The title of my Valentine. To thee my dearest Valentine. But be my faithful Valentine. Hmm, they certainly had a way with words! Love it. A few even managed to make me giggle. Happy Valentine’s Day, Marin! I love them–some of them are so amusing. 🙂 Happy Valentine’s Day! Thank you for sharing! Happy Valentine’s Day Marin! Thanks for stopping by, Tena! Happy Valentine’s Day! With writing in that era, I enjoyed reading those. Thanks for the research! You’re welcome! I love finding little treasures like those verse books.